Metasploit was developed by HD Moore as an open source project in 2003. Originally written in Perl, Metasploit was completely rewritten in Ruby in 2007. In 2009, it was purchased by Rapid7, an IT security company that also produces the vulnerability scanner Nexpose. Metasploit is now in version 4.9.3, which is included in our Kali Linux. It’s also built into BackTrack. For those of you using some other version ofLinux or Unix (including Mac OS), you can download Metasploit fromRapid7’s website.For those of you using Windows, you can also grab it from Rapid7, but I do not recommend running Metasploit in Windows. Although you can download and install it, some of the capabilities of this hacking framework do not translate over to the Windows operating system, and many of my hacks here on Null Byte will not work on the Windows platform. 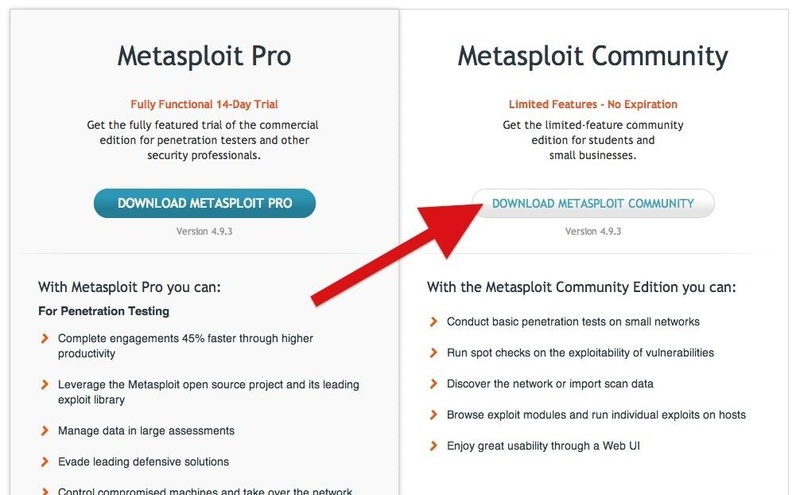 Metasploit now has multiple products, including Metasploit Pro (the full commercial version) and the Community edition that is built into Kali and remains free. We will focus all of our efforts on the Community edition, as I am well aware that most of you will not be buying the $30,000 Pro edition. Metasploit can be accessed or used in multiple ways. The most common method, and the one I use, is the interactive Metasploit console. 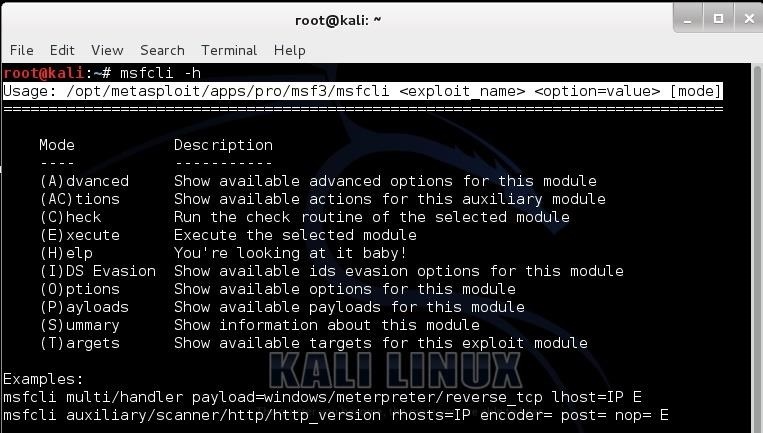 This is the one that is activated by typing msfconsole at the command line in Kali. There are several other methods as well. First, you can use Metasploit from the command line, or in msfcli mode. Although it appears that when we are in the console that we are using the command line, we are actually using an interactive console with special keywords and commands. From the msfcli, we ARE actually using a Linux command line. Where E is short for execute. In my tutorial on creating payloads to evade AV software, we are using themsfencode and msfpayload command in the command line (msfcli) mode. The drawback to using the msfcli is that it is not as well-supported as the msfconsole, and you are limited to a single shell, making some of the more complex exploits impossible. 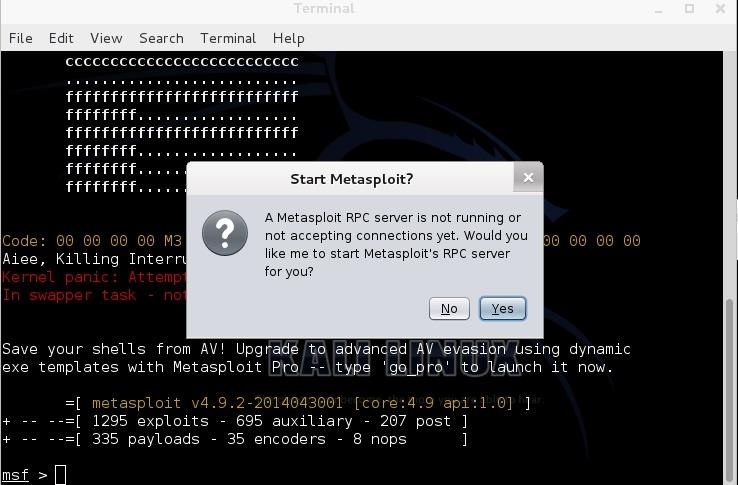 If you want to use Metasploit with a GUI (graphical user interface), at least a couple of options are available. First, Raphael Mudge has developed the Armitage (presumably a reference to a primary character in the seminal cyberhacking science fiction work, Neuromancer—a must read for any hacker with a taste for science fiction). Armitage is a GUI overlay on Metasploit that operates in a client/server architecture. You start Metasploit as a server and Armitage becomes the client, thereby giving you full access to Metasploit’s features through a full featured—thought not completely intuitive—GUI. If you really need a GUI to feel comfortable, I don’t want to discourage you from using Armitage, but mastering the command line is a necessity for any self-respecting hacker. Payloads are the code that we will leave behind on the hacked system. Some people call these listeners, rootkits, etc. In Metasploit, they are referred to as payloads. These payloads include command shells,Meterpreter, etc. The payloads can be staged, inline, NoNX (bypasses the No execute feature in some modern CPUs), PassiveX (bypasses restricted outbound firewall rules), and IPv6, among others. 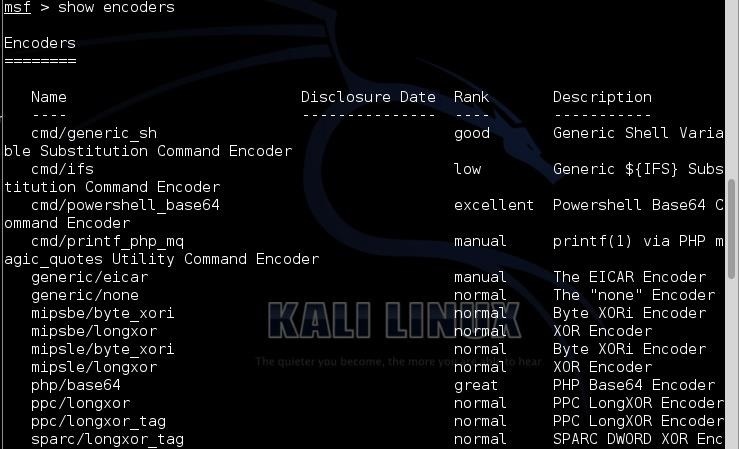 Exploits are the shellcode that takes advantage of a vulnerability or flaw in the system. These are operating system specific and many times, service pack (SP) specific, service specific, port specific, and even application specific. They are classified by operating system, so a Windows exploit will not work in a Linux operating system and vice versa. Post are modules that we can use post exploitation of the system. Nops are short for No OPerationS. In x86 CPUs, it is usually indicated by the hex 0x90. It simply means “do nothing”. This can be crucial in creating a buffer overflow. We can view the nops modules by using the showcommand. Auxiliary includes numerous modules (695) that don’t fit into any of the other categories. These include such things are fuzzers, scanners, denial of service attacks, and more. Check out my article on auxiliary modules for more in-depth information for this module. As you can see, there are numerous encoders built into Metasploit. Once of my favorites is shikata_ga_nai, which allows us to to XOR the payload to help in making it undetectable by AV software and security devices. Ever since Metasploit 4 was released, Metasploit has added search capabilities. Previously, you had to use the msfcli and grep to find the modules you were looking, but now Rapid7 has added the search keyword and features. The addition of the search capability was timely as Metasploit has grown dramatically, and simple eyeball searches and grep searches were inadequate to search over 1,400 exploits, for instance. The search keyword enables us to do simple keyword searches, but it also allows us to be a bit more refined in our search as well. For instance, we can define what type of module we are searching for by using the type keyword. When we do so, Metasploit comes back with all 1,295 exploits. Not real useful. If we know we want to attack a Sun Microsystems machine running Solaris (Sun’s UNIX), we may want may to refine our search to only solaris exploits, we can then use platform keyword. Now we have narrowed our search down to only those exploits that will work against a Solaris operating system. As you can see, this narrows are results down to just five exploit modules! Metasploit has many capabilities that are still untapped by us, so I will continue this Metasploit series to explore the simplest to the most complex. 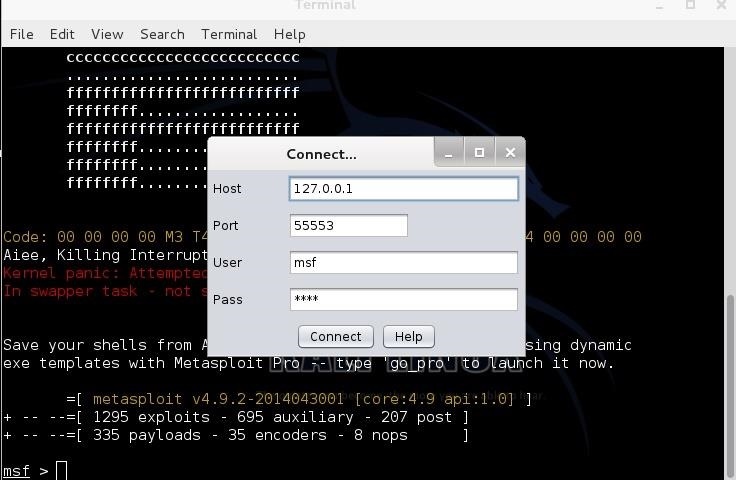 In the meantime, try some of my Metasploit hacks outlined in many Null Byte posts and keep coming back to this series on Metasploit to learn to hack like a pro!